First, some baby-bird background. Baby birds are classified in their degree of independence at hatching along two scales. On the ends of one are the opposites altricial (unable to regulate one’s own body temperature) and precocial (able to thermoregulate). On the other are nidicolous (staying at the nest after hatching) and nidifugous (leaving the nest). Junco chicks are altricial and nidicolous, naked and cold and unable to walk or fly at hatching. Ducklings are precocial and nidifugous, insulated by downy natal fluff and able to walk out of the nest. Seagull chicks are precocial but nidicolous, a rather unusual combination: they are fluffy but stay in the nest. No birds are altricial and nidifugous. Junco chicks are altricial and nidicolous. So are human babies. Photo by M. LaBarbera. Love one kid less than the others. In humans it’s taboo to say that you prefer one of your kids over another. Birds have no problem favoring some chicks. Many species have “insurance chicks,” extra chicks that, under normal circumstances, they allow to die. Usually these are runts, hatched a day or more after their siblings. A bird that is usually able to raise five chicks might begin incubating after laying her fifth egg, but then lay an additional one. This egg will be a day behind its siblings, since it missed the first day of incubation, so it will be smaller. In a normal year it will be allowed to starve. However, if one of other eggs fails to hatch, or if there is an unusual abundance of food, that sixth chick will be fed and raised. This helps birds deal with the uncertainty of food and hatching success. Condone violent sibling rivalry. In Blue-footed Boobies, this process has an extra, sibling-rivalry twist: the insurance chick is kicked out of the nest or killed outright by his older sibling. Leave the kid at someone else’s place and flee. Cuckoos and Brown-headed Cowbirds are brood parasites, meaning they sneak into other species’ nests, quickly lay an egg, and fly away. The host species, more often than not, accepts the additional egg and raises the parasitic chick as one of its own. This happens to juncos quite often: I’ve twice seen a beleaguered junco parent proudly feeding a cowbird fledgling twice its size. …but first, teach the kid to bully his foster-siblings. 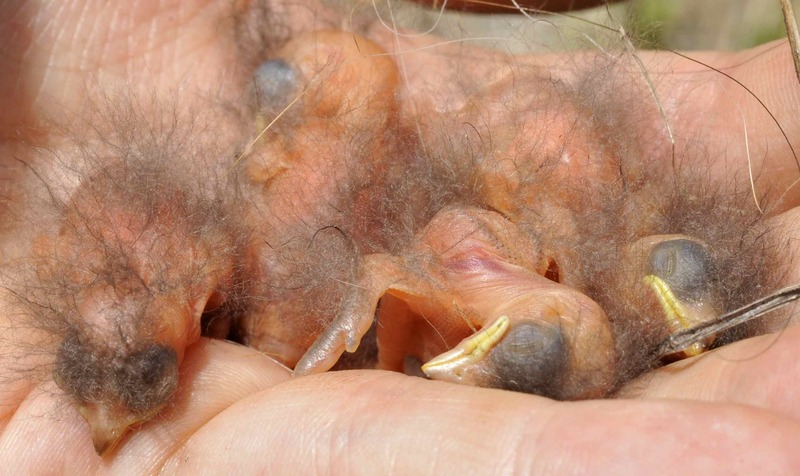 Brood parasitism might not seem so bad, but it is often disastrous for the host’s real chicks. Some species of brood parasites will, just after hatching, push all other eggs out of the nest. (Video here; mute or endure moralizing music.) Others have a sharp hook on their beak that they use to kill their foster-siblings. Still others simply out-compete them for food, displaying redder mouths and giving calls that sound like multiple begging chicks to the parents, so that their foster-siblings grow up undernourished and weak, or starve. Bury your baby in a pile of trash. No non-parasitic bird has parenting easier than the megapodes, whose chicks are the ultimate in nidifugous precociality. These Australasian birds, related to and rather resembling turkeys, bury their eggs in huge mounds of rotting vegetation. The heat from the rotting process incubates the eggs. The chicks, when they are ready, kick their way out of the egg with their big feet (mega = large, pode = foot), dig their way out of the mound of rotting stuff, and are immediately completely independent. They can run, they can catch prey, and some can even fly right from day 1. Megapodes have it figured out. This entry was posted in miscellaneous, video and tagged birds, eggs, megapode, nest, nestlings, parental care, science by toughlittlebirds. Bookmark the permalink.